An 800-year-old inscription detailing a donation during the Hoysala Regime has been discovered in Arattipura, India. This find is thought to be a very important discovery for researchers interested in Jainism, as it may provide evidence for an older Jain site than the sacred location of Sharavanabelagola. Arattipura is an archaeological site that is protected by the Banglore Circle of the ASI. This site was previously known as Tippur. This inscription will give a lot of fodder for researchers who are trying to establish that this village is older than Sharavanabelagola, a holy centre for Jains. Tippur (Arattipura) was earlier ruled by the Gangas between 800 AD and 1000 AD and subsequently by the Hoysalas. 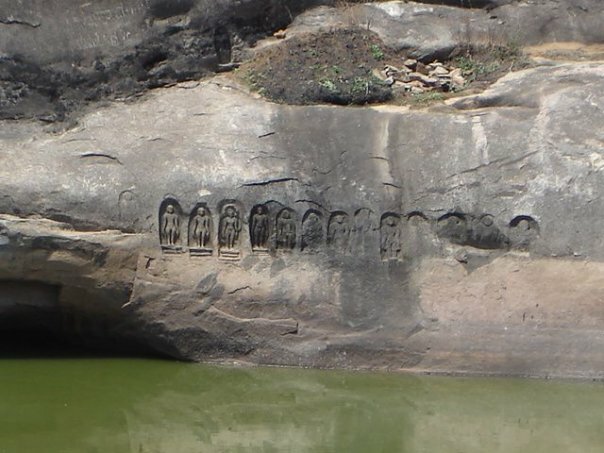 Detailed carvings on the rock face behind the pond at Arattipura, India. Enclosing the site are two small hills known as Shravana betta and Chikka betta. A small pond is located on hill which has detailed carvings on a rock face behind it and on the site lays scattered loose sculptures. Last year, when a small area of the hillock was exposed, the ASI team found the base of a temple consisting of garbhagriha (a sanctum sanctorum), pillared mantapa (pillared outdoor hall), yaksha (nature spirits), yakshi (a female earth spirit), and headless tirthankaras (people who have conquered the cycle of rebirth). At Arattipura numerous pillars, terracotta sculptures of women and men, conch bangles, and lamps have all been found during this excavation. Apart from the above mentioned artifacts, five temple complexes showing two phases of construction were unearthed in this excavation. These temples were made of brick and stone. According to Arun Raj T, the basement of the brick temples were plastered with lime and various shapes of lime bricks were used for construction. Along with other remnants, the first tirthankara — Adinatha was also exposed during the course, which may date back to Hoysala period. The Hoysala empire was a prominent Southern Indian Kannadiga empire that ruled most of the modern-day state of Karnataka between the 10th and the 14th centuries. The Hoysala era was an important period in the development of art, architecture, and religion in South India. The Hoysala rulers were known to promote religious tolerance and altogether they built over 1500 temples during their ruling. These temples were split up into worshipping sites for the Shaivite and Vaishnavite sects of Hinduism as well as Jain spiritual centers. The current discovery suggests that the worshippers of Jainism wished to increase followers of their faith. Nice post I did not know India had such things.